Park Place Nursing & Rehabilitation Center team celebrates Vohra certification. The Vohra Wound Care Certification underscores Park Place Nursing and Rehabilitation Center's focus on healing and rehabilitation for its residents. 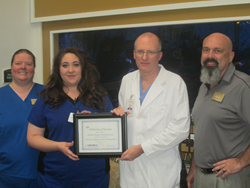 Park Place Nursing and Rehabilitation Center, part of the award-winning network of StoneGate Senior Living facilities, announces it has been certified by Vohra Wound Physicians as a Center of Excellence for Wound Management. Only 10% of Vohra’s skilled nursing facility partners have qualified for this annual certification. Certification criteria for this recognition includes a facility wound-related hospitalization rate of less than one percent, tracking and reporting of wound outcomes, VOHRA physician-led weekly rounds, and a Vohra-certified nurse on staff. Park Place offers three certified nurses on staff, with additional certifications in progress. Park Place’s partnership with Vohra wound physicians ensures that physician-led bedside wound care is provided at the facility for treatment of wound and skin issues, reducing the need to send residents out to wound care centers or hospitals. Park Place has an interdisciplinary team to care for residents. The wound physician works with the primary care physicians, physical therapists, staff nurses and other specialists to ensure residents receive excellent wound care. As long-term facilities continue to provide more specialized services with complex ailments, the presence of a wound physician is an important link in providing the superior care Park Place is recognized for delivering. Founded in 2000, Vohra Wound Physicians is the leading physician network devoted to post-acute wound care in skilled nursing and assisted living facilities. More than 240 physicians provide bedside care for patients in more than 2500 facilities across 27 states. We support our physicians and partners through our proprietary electronic health system, telehealth platforms, robust wound predictive tools, and most accessible and active education programs. For more information, visit http://www.VohraPhysicians.com. Founded in 1986, Park Place Nursing and Rehabilitation Care is a 120-bed facility committed to providing the community with the finest in rehab, 24/7 nursing, wound care, congestive heart failure treatment, bariatric support and a number of health and wellness solutions. It is a member of the StoneGate Senior Living, LLC family, an award-winning, full-spectrum senior care and housing company. StoneGate Senior Living, LLC provides support services to senior living and care properties that offer skilled health care, assisted living, memory support and independent living locations in Colorado, Oklahoma, and Texas. Founded and led by a team of senior living industry veterans, StoneGate understands that careful attention to customer expectations is vital to the success of a senior living and care community.